Smart TV brings all kinds of online Apps, information and entertainment to the living room. Many consumers owning a Smart TV platform are enticed to connect it to their broadband connection as the diversity and attractiveness of Apps offered are very attractive ranging from CatchupTV, video on demand to games. Smart TV has built up strong partnerships with App suppliers in the recent years. Through these key partnerships the attractiveness of the Smart TV homescreen has increased significantly and can be seen as the leading offer on connected TV’s. How to develop a successful App? Attractive Apps such as YouTube and Netflix are driving many consumers to the Smart TV homescreen as there they can find their favorite Apps and be enticed to try out new Apps from the App gallery! New Apps will be placed on in the App gallery to be selected by the consumer. The partner can purchase banner impressions to become visible on the banner on the homescreen, App gallery and IP-EPG. All new Apps for the App gallery can be funded by in-App advertisement. As indicated by the above figure, developing an App for Smart TV platforms has implications on the way it is navigated and appears. The user interface of your App will have to be optimized to be usable on a television. The television as a platform has similar restrictions to an optimized mobile platform. What is the difference in TV Browsing? Users obviously perceive browsing on a television differently to browsing using other platforms, like a PC web browser or mobile phone. The television platform experience is closest to a mobile browsing experience in the way Apps are navigated using a four directional cursor, and screen real-estate is low, even though the size of the screen is large. Pages are navigated using a remote control. 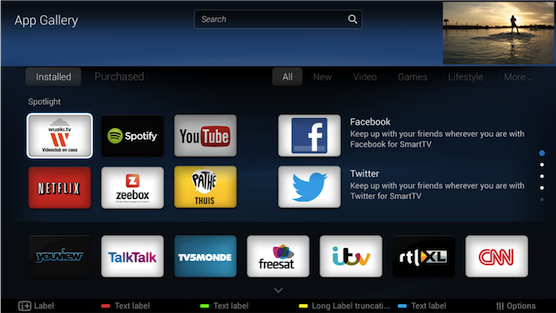 The Smart TV Homescreen offers Apps in a categorized way, to ensure they are found back easily. Users will access your App directly from the Smart TV Homescreen. A visually strong thumbnail, explaining the purpose of your App, will lure users into accessing it faster. The order in which thumbnails appear in the list is determined by the times they were accessed using the Smart TV Homescreen. Make sure the thumbnail you supply communicates well with what the benefit is of your App and in the appropriate category. How to port your App to television? When planning your design prepare for strong simplification of your current WIMP operated website. (Windows, Icons, Menu’s, Pointer) Because of the nature of the platform, you may need to rethink the way you currently provide access to your content. Determine what functionality should be accessible from the television, what should be excluded, and what functionality has priority. A television invites lay back behavior and the shortest route into consuming content. Break the different functionalities into logical pages. Determine for each page layout its core purpose, and optimize accordingly. More detailed guidelines are given in App How-tos. Contact an interaction design agency if you need advice on how to split functionality.